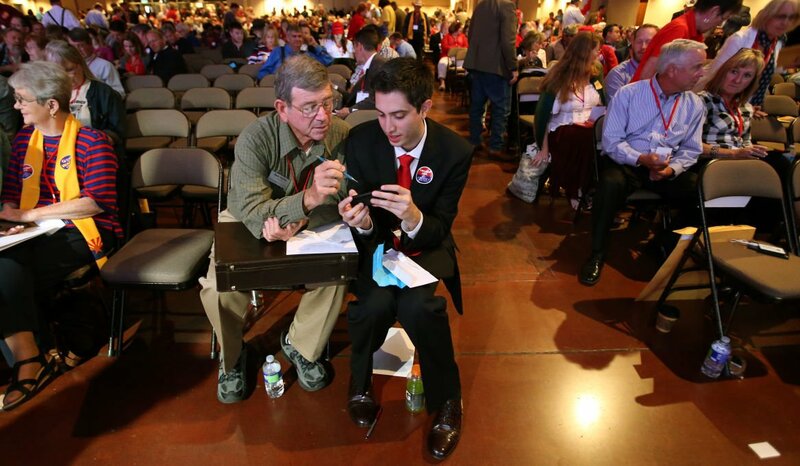 Santa Cruz County Republican chair Zack Taylor, center left, at the 2016 Republican State Convention in Mesa. Douglas Mayor Roberto Uribe is facing a recall election after petition signatures were approved by Cochise County. Oro Valley resident Mike Shaw has been hired by the Arizona GOP as the party’s political director. When you ask leaders of the county political parties about precinct committeemen, they tend to use the same metaphor. Precinct committeemen are the parties’ “boots on the ground,” they say. And they almost always say they need more. The “PCs,” as they are known, knock on doors during campaigns, decide the leaders of the county and state parties, and generally do the grunt work of politics at the neighborhood level. They matter a lot, which is why a recent meeting of the Legislative District 2 Republicans got testy. Zach Taylor has for years been the chairman of the Santa Cruz County Republican Party. That is, of course, not a very big party in the Democrat-dominated county where Nogales is the seat. As of January, there were 4,645 registered Republicans in a county of 28,587 voters — about 16 percent of the total. Democrats made up about half the total. But the GOP could be bigger than it is — and should be, Taylor’s critics say. Certainly it should have more than 14 precinct committeemen out of a possible 58, they say. One of Taylor’s chief detractors has been Sergio Arellano, a Pima County resident who for a time was the GOP chair for Legislative District 2, which overlaps most of Santa Cruz County while including a big swath of Pima County. He also ran for the Republican nomination for Congress in District 3 last year. In recent months, Arellano has made common cause with Steven McEwen, who moved to Rio Rico from Montana in 2017 and found Taylor unresponsive around the election last year, when McEwen wanted to sign up as a poll-watcher for the party. Arellano told me their enmity dates back, in part, to his own recommendation of two local Republicans to be precinct committeemen. Taylor did not appoint them, Arellano said. A similar pattern continued up to this year, when McEwen recommended additional precinct committeemen. Taylor did not appoint them, either. The issue blew up at a March 16 meeting of Legislative District 2 Republicans, when Taylor turned down the application of a U.S. Border Patrol employee who wanted to be a precinct committeeman. In a video posted by the Arizona Daily Independent, Taylor is shown lecturing the man about the Hatch Act, which prevents some federal employees from engaging in partisan political activity. Taylor said he checked with the employee’s Border Patrol supervisors, who said he could not serve as a committeeman, but separately, McEwen got an opinion from the federal Office of Special Counsel, which said he could. The Border Patrol employee ended up not serving. Arellano and some others suspect that Taylor limits the number of precinct committeemen to loyalists, so that they don’t vote him out of power. But Anthony Sizer, the current chair of LD 2 Republicans, pointed out that the percentage of PC positions filled is higher among Santa Cruz County Republicans than among some other parties. At 14 out of 58 possible slots, that’s a 24 percent rate. That’s similar to the Pima County Democrats’ 478 precinct committeemen out of 1,815 allotted positions — a 26 percent rate. And the Pima County Republicans are at 346 out of 1,494, a 23 percent rate. Santa Cruz County Democrats are in worse shape at 17 out of 135 possible, or 13 percent, county data show. Sizer said he has heard the evidence and comes down on Taylor’s side. The Pima County Republican and Democratic party chairs both told me they’re working hard to boost their PC numbers. That’s hard to achieve in a county where you need to find a total of 1,494 volunteers; not as hard in a county like Santa Cruz where you’re looking for a total of 58. Douglas Mayor Roberto Uribe will face a recall election now that enough petition signatures have been certified as valid by the Cochise County recorder. Under state law, Uribe has until Friday, April 12, to resign or face a new election. He told me he’s not planning to resign, so an election will have to be set. The council chose not to renew the city manager’s contract in January, sparking outcry among some. Douglas resident Tanya Duarte told me in February that she started the recall because Uribe had violated the city charter and showed favoritism in the way he ran the city. Uribe is a relative newcomer to Douglas, having moved in 2012 to his wife’s hometown. That’s made it harder for him to penetrate the longstanding social networks and convince people he, not Duarte, is in the right, the mayor told me. When Vice President Mike Pence visited Nogales Thursday, he gathered a small circle of local dignitaries, including a sheriff. But it wasn't the sheriff of the county he was visiting, Santa Cruz, who got the invitation to travel a couple of miles to the Border Patrol station and visit with the veep. Sheriff Tony Estrada was not invited. It was the sheriff of neighboring Cochise County who received the invitation from Pence's team and spent a short time with the vice president. Mark Dannels, his office said in a press release, said "I appreciate the invitation and opportunity to support our community as Sheriff, and to provide local input to insure our voice is heard as policy and best practices are developed." Dannels' office cited his representation of the National Sheriff's Association and the Advisory Council for Homeland Security as factors in his visit. Estrada told me he was fine with Dannels' coming over for the event, but a courtesy call to the local sheriff would have been appreciated. Of course, it likely played into the sheriff selection the fact that Dannels is a Republican who frequently raises the alarm about border-security issues, whereas Estrada is a Democrat who frequently argues that things are pretty calm on the stretch of border his county fronts. Oro Valley resident Mike Shaw has assumed a big job with the state Republican Party since Kelli Ward won election as party chair in January. Shaw, who has produced political videos and has been a radio host in Tucson, was hired as the state party’s political director. What that means, largely, is working on get-out-the-vote efforts and recruiting and organizing precinct committeemen, Shaw said. While Shaw is the only staff member from Southern Arizona, there are three statewide office holders in the state GOP. Parralee Schneider is first vice chair, Cindy Coleman is second vice chair, and Bruce Ash, of course, remains a member of the Republican National Committee. Shaw said he plans to move to Paradise Valley in May. The state's largest utility was forced to reveal how it spread ratepayer money into Arizona political races.